As a Girl Scout Cadette (grades 6–8) taking part in the Girl Scout Cookie Program, you’re helping lead the largest entrepreneurial program for girls in the world. You’re learning essential life skills, setting (and crushing!) impressive goals, and using your cookie earnings to go on epic adventures and make the world a better place! Many of these incredible skills and accomplishments start with a Girl Scout badge—and we’re about to explore all of the badges Cadettes can earn during cookie season. When you earn the Cadette Budgeting badge, you’ll learn how to keep track of your money, save for things you need and want, and help others by giving back. Building a budget is more than a way to track your money—how you choose to spend your money shows what’s important to you. So you’ll group your decisions into three categories—spend, save, and give—and then track each. Keep an eye on your spending habits, learn how you can save, and explore all the wonderful ways you can give. Your newfound skills will help you create a budget that’s right for you. Earn this badge. By earning the Comparison Shopping badge, you’ll discover how to find the best online deals on the best products in the safest way possible. Shopping online can be overwhelming, with unlimited options at your fingertips, but learning how to compare sites and research online deals can help you narrow your decisions. Learn how to access online reviews that can guide smart spending decisions and how to steer clear of online fraud by identifying questionable sites and keeping your personal information safe and secure. Earn this badge. You already know how to build a budget for yourself (thanks to the Budgeting badge), but have you ever thought about building one for a business? You are a cookie boss, after all. With the Business Plan badge, you can! You’ll first write your mission statement—one that shows why your troop participates in the Girl Scout Cookie Program and the goal of your cookie business. Then you’ll start growing your customer base, learning how to turn that “no thank you” into a “yes please!” And since Girl Scouts are always prepared, you’ll want to create a risk management plan, brainstorming solutions to problems your business may face during cookie season. Earn this badge. You have your business plan set—now it’s time to market your business! Through the Marketing badge, you’ll learn to create a marketing plan that will help your cookie business grow, grow, GROW! You’ll learn all about brand identity (how a company looks to the outside world), scope out the competition and learn from it, and get inspired by companies that also give back to the community using part of their profits. Ultimately, you’ll build a marketing campaign that will entice customers to come to YOUR cookie booth to buy their favorite sweet treats. Earn this badge. 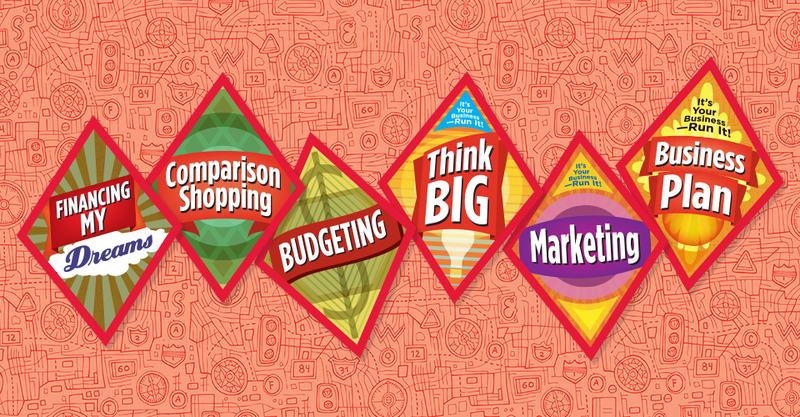 The last of the Cadette badges we’re highlighting is the Think Big badge, a fun one that will help you take your cookie business plan to the next level and inspire you to set higher goals for your cookie earnings. You’ll start thinking “big cookie goal ideas”—those that will challenge your troop to do great and exciting things. Will you go after your Girl Scout Silver Award? Save up for an epic troop trip? Don’t hold back—now’s the time to “think big”! Once you’ve set your big goal, you’ll strategize ways to take your cookie sale to the next level to make it happen. You might share your plans with your cookie customers, ask for help from local experts, and/or come up with your own ideas that work for your troop. Earn this badge. Has your Cadette earned one of these awesome badges, but you don’t know where to place it on her vest or sash? Our new visual guide to Girl Scout Cadette uniforms can help!